Shingles is a painful skin rash that is caused by the same virus that causes chickenpox. Each year in the United States, there are approximately one million cases of shingles, and one-third of Americans will develop shingles in their lifetime. Shingles most commonly occurs in people aged 50 or over, but it can affect anyone who has had chickenpox. In most cases, shingles is not contagious, but it may be possible for someone with shingles to spread the virus to someone who has never had chickenpox or received the chickenpox vaccine. While it is possible to have shingles more than once, most people who get shingles will not have a subsequent outbreak. The painful rash from shingles is caused by the reactivation of the chickenpox virus that lies dormant in the nervous system. There is usually no known reason why the virus reactivates, but possible triggers can include aging, certain diseases, stress, or some medications. Shingles usually begins with flu-like symptoms, followed by pain, tingling, and itching on a certain part of the body. Several days after the pain starts, a rash appears that could turn into fluid-filled blisters. These blisters may continue to appear for a week, and scab over about ten days later. 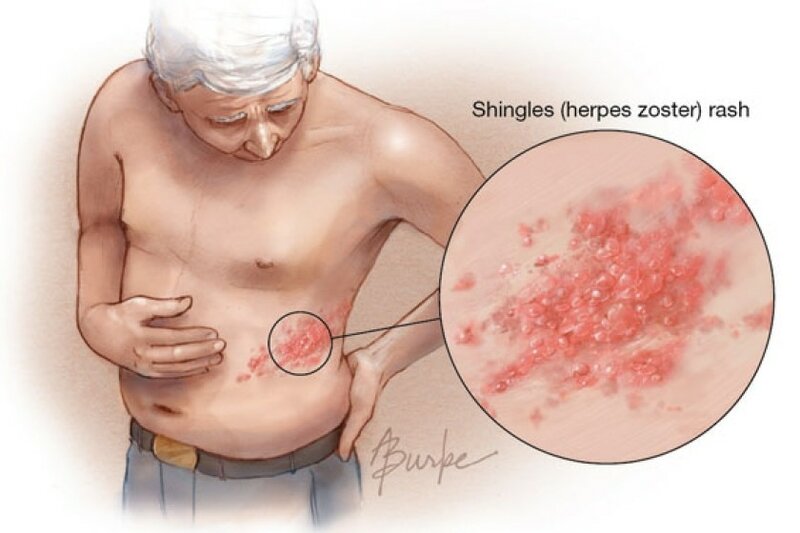 The total time for a shingles episode is from two to four weeks, but the pain from shingles may persist after the infection has healed and the rash has disappeared. This pain is known as postherpetic neuralgia, and occurs in 10-20 percent of patients. Shingles is most often treated with medications, both antiviral and pain medicine. At-home remedies include taking antihistamines or using Calamine lotion to help with itching, keeping the rash clean and dry, and wearing loose clothing to help prevent the pain of touching the rash. Treatment for postherpetic neuralgia may include medication, skin patches, and for some cases, neuromodulation. Are you ready to take control of your shingles related pain? Contact our office today to schedule your consultation today.